The problem with the “energy weapon” is that it is notorious for backfiring. That fact couldn’t have rung truer than this week when it was reported that Germany, a major natural gas importer in Europe, was going to co-finance the construction of a $576 million liquefied natural gas (LNG) receiving terminal in northern Germany. The announcement, billed as a “strategic move,” is the culmination of years of European diversification away from the grip Russia had on Europe’s natural gas market when it briefly cut off supplies to Ukraine in the winter of 2006. It is important to note that back in 2006, commentators were quick to point out that the dispute between Ukraine and Russia did not significantly disrupt Europe’s access to Russian gas and was settled quickly. But the die was cast in the minds of policy makers: Russia held too much leverage. European governments, utilities and private industry responded dramatically. The continent made a crash campaign to build LNG receiving terminals, to promote freer trade in cross-border electricity and natural gas trade, to pass anti-monopoly legislation aimed at Russia’s state firm Gazprom, and to bulk up on renewable energy. More than a decade later, as the U.S. industry prepares a massive wave of LNG exports, Gazprom is sending out the message that its main goal moving forward is to preserve its market share, even if it means sharply discounting its prices. The change in strategy comes in the wake of internal criticism at the highest levels inside the Kremlin that Gazprom suffered market setbacks between 2009 and 2013. After growing steadily since the early 2000s, Gazprom’s market share in European gas markets fell to 23 percent in 2009 in the aftermath of the Ukraine crisis. Market problems continued through 2013 when the state firm started to implement a new price discounting model. That market-oriented response included partial retroactive payments back to customers to compensate them for the gap between natural gas spot market prices and higher oil-linked prices contained in Gazprom’s long-standing contracts. Contract revision demands from European buyers after 2006 has resulted in the volume of spot market and oil and gas hybrid-indexed pricing for European gas purchases to hit over 70 percent of sales, up from less than 20 percent in 2008. In response to these changes in market conditions, Gazprom also postponed indefinitely its Shtokman LNG export project. The origins of Gazprom’s shift were chronicled recently at a presentation at Columbia University’s Center for Global Energy Policy, where Russian energy scholar Tatiana Mitrova told a U.S. audience that the flexibility of Russia’s new pricing and sales regime is a direct result of rising renewable energy installations in Europe, combined with the emerging threat of U.S. LNG exports. The latter prompted the Kremlin to diversify away from reliance on Gazprom for exports with the approval of Novatek’s initiative to develop Yamal LNG in 2013. The project is considered a successful one inside Russia. Gazprom contracts totaling roughly 16 billion cubic meters (bcm) are due to expire in the next few years. Poland, which built an LNG receiving terminal in 2015 with help from Qatar, has already announced it will not be renewing its gas dealings with Russia, likely in favor of U.S. LNG. Lithuania also has a new LNG receiving terminal. It remains to be seen to what extent other European countries will follow suit. 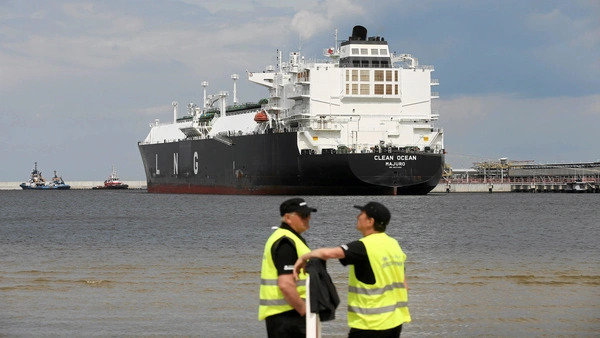 Germany’s declaration that it too will expand access to U.S. LNG via a new import terminal is telling, since Germany’s leaders had previously staked out a strident pro-Russian gas position amid U.S. objections to the Nordstream 2 gas pipeline project from Russia to Germany. Europe’s LNG import capacity stands at 20 billion cubic feet per day (bcf/d) and LNG imports averaged 5.1 bcf/d in 2017. Russian pipeline gas represented 35 percent of total European gas use in 2017, slightly higher than the level Russia’s Gazprom says it seeks to maintain. There is much debate about the price point at which U.S. LNG can compete with Russian gas in Europe, and the numbers vary in large measure given different assumptions about how much of the cost of capital will be recovered for U.S. LNG facility developers and what will constitute the value of the U.S. natural gas to be shipped. If one assumes the $2.25 export facilities fee (or higher) that is embedded into early U.S. LNG export contracts, Henry Hub natural gas spot prices, and ongoing transport costs, U.S. LNG needs a $6.00 to $7.00 million British thermal units (mmbtu) price to be competitive to Europe. This past summer, conditions were positive for U.S. shipments; at liquefaction and shipping costs of around $3.00 to $4.00 per mmbtu and spot prices for U.S. natural gas averaging just under $3.00, U.S. LNG could make landfall in Europe at under $7.00 per mmbtu, in line with comparable prices for other supplies. The spot price for LNG in Southern Europe traded between $7.70 mmbtu and $8 mmbtu this summer, a low seasonal demand time. Southern European prices are currently averaging around $9.50 mmbtu as winter approaches. If global natural gas markets got more price competitive over time, some integrated U.S. players are in a position to compete effectively with Gazprom. That’s because they would be able to lower or waive altogether facilities fees and will have access to gas that could be available on a zero cost, or even negative cost, basis since there will be plenty of stranded gas that is an associated waste product of valuable oil and natural gas liquids production and likely to be flared for no value if markets cannot be developed. On that basis, U.S. LNG can land into Europe at below $2.00 to $3.00 mmbtu. Mitrova estimates Gazprom’s hard Siberian production costs are $0.90 and then it has a $1.20 transport tariff cost for pipeline operations between western Siberia and the Russian border. An additional export duty is imposed by the central government of 30 percent of the sales price. This latter charge could presumably be lowered to allow Gazprom to be more competitive with U.S. supplies. In other words, if a global glut of natural gas were to develop in the coming years as some predict, the price point of U.S.-Russian gas competition in Europe could produce dramatically lower prices than today. The outlines of how U.S.-Russian energy dimensions might spill over into international relations are already apparent as European countries, including now apparently Germany, reassess how to manage their overall energy import mix. Some countries may opt to investigate higher use of renewable energy to politely bow out of the geopolitics of natural gas imports. Ironically, that might leave both U.S. and Russian natural gas sellers to duke it out with China, which is positioning itself as an exporter of solar panels and battery storage to Europe. China is also investing in European nuclear plants. Ira Joseph, who leads S&P Global’s European gas and power energy service, told the Columbia University Center for Global Energy Policy forum that the costs of battery storage could become a determining factor in European natural gas prices down the road. That development, if it materializes, was not anticipated in Moscow when it brandished the energy weapon so briefly in 2006. It highlights that energy security concerns can be a strong motivator for substitution of fuels.